Objet de Vertu covers an incredibly diverse range of objects. Typical objet de vertu seen at auction include bijouterie cabinets, French and Japanese scent bottles, papier mache boxes by Georg Siegmund Stobwasser, Palekh, miniatures, walking canes and tea caddies as well as carved ivory, often of English or European origin. 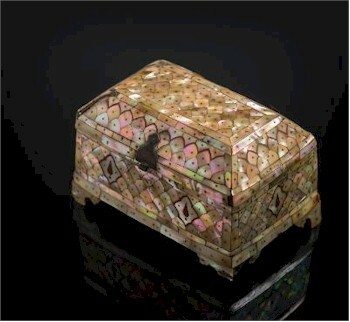 A rare Indian mother of pearl and stone casket (FS27/612) realised £28,000 in July 2015. Also amongst the objet de vertu commonly found in our auctions are the grand tour pieces such as plaster cameos that were commonly sold to rich English tourists and depict ancient or classical Roman and Greek mythology. The category also include treenwares (ie: small handmade functional household objects made of wood) such as Welsh love spoons, snuff boxes in the form of shoes as well as ginger bread moulds and a host of other similar items. The objet de vertu category also covers tunbridgeware (ie: decoratively inlaid woodwork from Tunbridge) such as sewing boxes, tea caddies, writing slopes and parketry boxes.